Shelby Brave: i'm only good at being young. maybe my favorite song lyric. ever. maybe because it's exactly how i feel. maybe it's how everyone feels...in some way. i have found that growing up comes with fears. of the unexpected. and the expected. i have found that it comes with the revealing that so much that i thought was true is not : : : people are not all nice and they will let you down. the easter bunny isn't real. the moon isn't made of cheese. grandpa did not walk up hill both ways to school. everything is not always gunna be okay, athough i wish it with all my heart. i can't do everything. and if you are in my backyard playing wiffle ball with daddy...there is crying in baseball. haha. but if all of this isn't true. what is true? 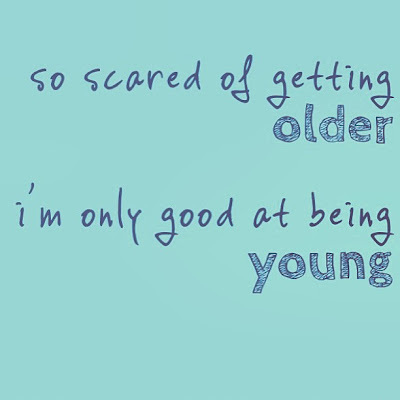 that is the scary part about growing up. i love being the youngest...don't get me wrong. i want to be a grown up. and be successful. and have a family and a great career. and do all those grown-up things. but i dont wanna get old. i want to stay young. kinda like peter pan. i think getting old is different than growing up. somedays i find that i am probably very fearful of what is to come healthwise. the future holds so many unknowns for me. we've been told my whole life by so many doctors "we're not sure." not sure of what will come. will my heart murmur get worse? can i have kids? will my tumor grow back? will my endocrine and lymphatic systems work well? these are all things we are so unsure about. and i assosciate them with getting old. so i would just really like to stay young. i'm really good at it. being young.